During 15 years of its activity, the Gjirokastra Foundation has fundraised for the successful implementation of about 50 projects, supported by more than 20 mostly international donors, with a total of over 2.5 million euros invested in Gjirokastra. The Gjirokastra Experiential Tours project (ongoing Project): Based on the new trend of developing tourism of experience, this project aims to identify the traditions of local families (both in Gjirokastra and in the surrounding rural area) and use them as a source for developing niche market tourism. Among the objective of this project is the promotion of the rich local and natural resources of the area, through their inclusion in tourist packages, using them for developing experiential tourism based on the local cooking, dancing, singing, and other traditions. The National Fair of Crafts, Heritage and Tourism: it has been held every autumn since 2007 and its aim is to encourage arts and crafts production with the goal of encouraging the use of heritage for developing tourism in Gjirokastra and at national scale. Every year, this Fair brings together more than 100 artisans, and craftsmen from all over Albania and the Balkans. The fair is held in the historic Bazaar of Gjirokastra, it brings a large number of tourists to the city and it is characterized by its festive and joyful atmosphere. Babameto House project (2010-2013) is one of the best examples of Restoration-Revitalization undertaken with abandoned buildings in Gjirokastra. This project brought together more than 70 owners of the property, two NGOs, and a partnership with state institutions; with donor support for its successful implementation. Now the House is open for the public, it is used as an example of revitalization and modern use of a typical Gjirokastra houses. Babameto serves as a Centre for Culture and Heritage, hosting cultural and tourism related events, as well as providing accommodation for tourists in form of a hostel. Babameto House is one of the top attractions in Gjirokastra, with a large number of visitors every year. EVAH (European Values in Heritage) Project was an inter-regional program funded by the EU (2010-13) for the establishment of a network between the organizations involved in the restoration and revitalization of the historic cities in 4 countries of the southwestern Balkan. The 24-months EVAH Project addressed these needs and constraints in the historic cities, by conducting specialized workshops, supported by various media. It aimed to make a structural impact through improved regulatory frameworks adopted by governments and parliaments, and to get the general public involved in improving the situation of their cultural heritage. By getting all the relevant stakeholders involved in the discussion and providing recommendations on how to protect and save cultural heritage it has been created a better environment for handcrafts and historic cities. (http://www.euheritagevalues.org/). The Gjirokastra Museum (2012) has been one of the most challenging projects of the Gjirokastra Foundation. It is one of the most modern museum built in the country after the fall of communism, and is housed in one of the most beautiful galleries of the Argjiro Castle in Gjirokastra. It showcases the historic and cultural tradition of the city and its surroundings area, from the prehistoric times to the current era; through historical and archeological objects, archive material, photographs, film and oral histories. The museum gives a good overview of the attractions to visit in the city and in the area. The historic development of the city and its surroundings is explained in two languages (Albanian and English), through narratives and display panels. Cold War Tunnel (2010- 2015). This project for the research, adaption for visitors, and promotion for the Cold War Tunnel of Gjirokastra started in 2010. The tunnel (built in 1970s) is one of the unique sites of the communist heritage in the country. It is situated under the Castle of Gjirokastra, behind the Bashkia (Municipality) building and was opened for the public in 2015. The Revitalization projects of the Bazaar of Gjirokasta (2007) – The revitalization of the traditional Bazaar started with the restoration of some buildings in the Bazaar, by showcasing artisan skills of heritage value at the annual National Culture Heritage and Artisan Fair in Gjirokastra. Currently there are arts and crafts shops in the Bazaar that benefitted from the restoration of these buildings. The promotion of the Albanian Iso-Polyphony project: Obelisku Iso-Polyphonic group project (2010) aimed at reconnecting the youth with the heritage and in particular with ancient polyphonic singing. Albanian Iso-Polyphony Singing has been recognized as an Intangible World Heritage by UNESCO in 2005. The ancient tradition of Iso-polyphonic singing is deeply intertwined with Albanian national identity, particularly in Southern Albania, and is still performed at social and community events. This project trained 14 pupils of 13-15 years of age selected from local schools, undeceived training from a local master. Since then the group has performed in many events around the country. 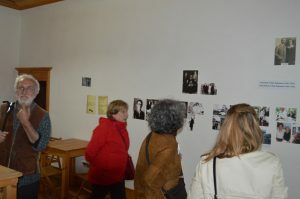 A CD has been produced with their songs available at the Babameto Center for Culture and Heritage. Restoration and Revitalization of Zekate House (2004-2005): In May 2004 a full study and recording of the architectural and distinctive features of the Zekate House was undertaken by Richard Andrews, through the Butrint Foundation. Professor Emin Riza (Institute of Monuments, Tirana), Albania’s greatest authority on the houses of Gjirokastra, subsequently designed a project for the first phase of conservation of the Zekate House, namely the conservation of the great stone roof, the windows and the basic structure of the building. The work on the house began in June 2004 and was completed in spring 2005. During spring 2005 the work began on the conservation of the interior of the Zekate House, led by two teams of specialists from the Institute of Monuments in Tirana. The frescos on the walls and fireplace in the great hall were conserved, as well as the decorative and painted woodwork in the rooms of the upper floors. In addition, local craftsmen replaced wooden elements in the windows and ceilings and specialists restored the elaborate stained glass windows. The work was completed in September 2005. Restoration of Hamam and Revitalization Seven Fountains of Gjirokastra: This project has transformed an ex town rubbish dump into a small park, restoring the Seven Fountains and Haman within it. The work was undertaken by the local office of the Institute of Monuments and was supervised by Richard Andrews, a senior architect-restorer from the UK. The project was completed in April 2004.